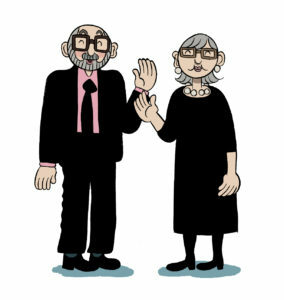 Two heads… -a graphic novel about social cognition, marriage and the importance of research. In 2014, Professors Uta and Chris Frith – both eminent neuroscientists who happen to be married to each other – were jointly awarded the Jean-Nicod Lecture Series Prize. It’s a prize awarded to philosophers of mind or, as in this case, ‘philosophically-minded cognitive scientists’. Prize winners deliver a series of four lectures, which they are then charged to collect in book form. The Friths delivered their lectures, two each, in November 2014. You can watch them online here (in English). The overall theme was ‘social interaction and social cognition’ – the ways and means that human brains use to recognise and interact with other people. The lectures are indeed being collected as a book (to be published by MIT Press), but the Friths decided to reach a wider audience by expanding on the theme, and presenting the whole thing as a graphic novel – a format that far better captures the visual element of their lectures and may prove to be a better way to communicate science in general. Working with their son, Alex Frith, a children’s non-fiction author, and comics author/artist Daniel Locke, the Friths have put together a 300-page comic called Two Heads… that explores, describes and explains social cognition. Along the way, the book also acts as a primer into the basics of neuroscience, from how the brain works to a short history of the people who developed the fields of psychology and neuroscience in the 19th and 20th centuries. In order to tell the story of social cognition, the book also examines Chris and Uta Frith’s own experiences as a married couple, and as pioneering neuroscience researchers from the 1960s to the present day. In particular, it unpicks their key discoveries in relation to schizophrenia and autism, two conditions that turn out to be remarkably relevant to the question of how brains interact with each other. Read it and learn!